Geography/Culture: Aztec. Nahua of Mexico, and Chichimecs. Description: Some say Dragon-like Goddess of the hunt; Old Heroine; Sacrificed Goddess; She Who died in childbed; She Who is associated with the Female Demons of the west, the souls of women who have died in childbirth. Others say Beautiful Goddess of the soul and death; She Who wears symbols of death tattooed on Her face; She Who once came to earth to pick roses. And still others that She became Goddess of the melon cactus. To Whom Sacred: melon-cactus; roses; butterfly (Her wings were tipped with obsidian); jaguar-claws (Her material aspect); obsidian tools (perhaps especially the knife); facial tattoo. 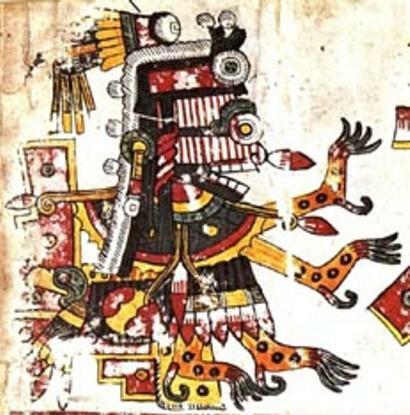 Perhaps an alternate name, or aspect, of Cihuacoatl, Snake-Woman, Who is linked with Chicomecoatl, even-Serpents. Perhaps related to Mayan Ixtab, E$T0B, ----, Who cares for the souls of suicides. Source: Monaghan BGH 157; NE.GM/190-1, 196.
worked on: October, August, July 1995; August 1991.